People investing or selling USA silver coins should be aware that, due to wear in circulation, $1000 face value in dimes or quarters yields not 723.38 troy ounces as the coin book would imply, but 715 troy ounces; and halves a little more because they show less wear on average. First of all, if you don't need the money don't sell. Think of silver as future gas money. In 1964 one could buy a gallon of gas for about three dimes. Those same three dimes will buy a gallon of gas today. Buy the gold/silver ratio at 54 (kitco.com) shows it on their main page. Just because you didn't buy silver at $5 an ounce; doesn't mean its too late. That was 5 years ago, who's to say where things will be in five years from today. Finally, you it as a savings plan, 5% every month is good enough for most. PS don't listen to your friends like I did in 1978 who told me not to buy gold. As TomAlciere said, older coins have wear and thus, less silver. Buy only coins from the 1960's that show no wear from circulation. Try this, stack 10 old worn Mercury dimes next to 10 1964 Roosevelt dimes. The difference in the height of the stacks is impressive. If you buy old worn coins for the same price as newer coins, you are cheating yourself. If I were you, I'd still be me. The game plan is the same for people with a lot or a little money. Convert dollars to silver. Silver that will be in the most demand and easy to buy or sell. I would go to the local coin shop and buy as many of the "Common Rounds" as you can. They are the cheapest way to aquire One Ounce Coin. I stay away from the Chineese Panda coins cause there are counterfeits out there. eBay had an article describing how to tell the most obivous counterfeits. Do a google to find that info. I also stay away from the Mexican Onza. Don't trust that country for anything. 98% of the coin you come across in the shop will be American made. If it looks "strange" don't buy it. When you clean out the shop of the "rounds", then go to the One Ounce bars. Again use your common sense when you buy them. Englehard, Johnson Matthey and Sunshine are well known mints. No "testing" needed. I've even bought "Merry Christmas" bars and "Happy Birthday" bars. Most dealers screen the stuff they buy, so when you get to know a dealer real well, you'll be able to trust his judgement. Now, if you've cleaned out them of the 1oz stuff, go to www.tulving.com to buy American Eagles. I haven't seen anyone beat his prices yet. You can now buy a lot of 300 Eagles, instead of the 500 Green Monster, for a minimum order. Shipping is free. And he'll buy them back for $1.15 per coin when you sell. Cost to you is about .60 per coin plus your cost to ship them back. Get a coin collector's book and see if any of your 90% coins have numismatic value substantially in excess of their melt value. If you have a few, sell those and buy 999 bullion bars or rounds. This way you convert a speculative value into purely physical value which will appreciate much more as Silver goes up in value. I hope you have your very own personal defibrillator on hand after eating a steady diet of THAT! Last edited by akak; 21st October 2008 at 19:13. I think they may be on to something here. Unlike JewsterJay, I will touch Spam. Me not smart enough to leave it alone. 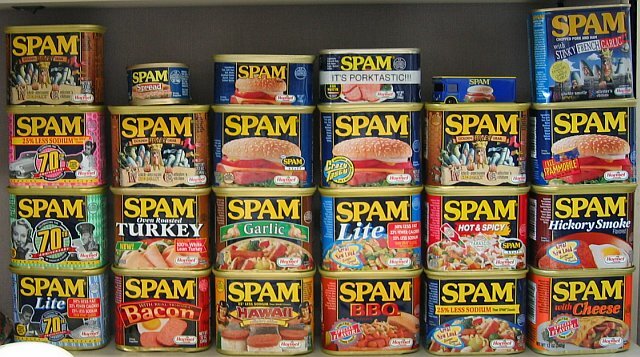 I think Spam might taste extraordinarily good to some peeps about three weeks after a major disaster. One tin might be worth almost a sovereign.